As a mother, wife and grandmother, I know how important it is to start your day off with a good breakfast. However, there are times when my family sleeps in and our breakfast ends up being a well-balanced brunch! 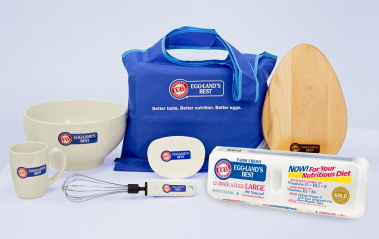 I was recently sent an Eggland's Best Brunch Kit, so that I could treat my family to brunch. Inside my kit I received a ceramic mixing bowl, wire whisk, egg shaped wooden cutting board, bowl scrapper, coffee mug, a tote bag, a gift card (to get ingredients) and an Eggland's Best coupon. Before I get started on telling you what I made for brunch, I want to talk to you all about the Eggland's Best Eggs. This brand of eggs has been our preferred brand for many years and I am going to tell you why! · Plus, in my personal opinion, they just taste better than other brands of eggs! For our family's brunch, we made sausage and egg rolls, bacon and egg rolls, lean ground sausage, turkey bacon, banana nut muffins, chocolate milk and orange juice. To make our sausage and/or bacon egg rolls, we used our Rollie and the egg rolls turned out perfectly! You can find some yummy looking breakfast and brunch recipes on the Eggland's Best web site. Some of the ones that we want to try are: Eggland’s Best Breakfast Burrito Recipe and the Eggland’s Best Sunny Side Breakfast Pizza Recipe. In addition to making some brunch for my family, I made up a batch of deviled eggs and a batch of pickled eggs with red beets for my family to snack on throughout the week. Within a few days, the entire tray of deviled eggs and the container of pickled eggs were gone! That's right folks, my family loves Eggland's Best Eggs! I don't have to worry about my family and their love for eggs, because I choose to purchase the best eggs out in the retail marketplace. The Eggland's Best Eggs are high in vitamin E, high in Omega 3's and have less saturated fat than other brands. As a mom, wife and grandmother, I am proud to serve my family these high-quality and nutritious eggs! We would like to thank Eggland's Best Eggs for treating us to a delicious tasting homemade brunch and for supplying the ingredients for brunch and our egg appetizers. Your eggs are the best! I would like to try their ham and swiss quiche. Would love to try the Greek Easter Bread! Follow Shakin & Bakin Foodie Blog on Google Friend Connect. The poppy seed orange cake looks fantastic! I like Eggland's Best on Facebook. I would like to try the ham and swiss quiche from the egg lands site! I follow @ClassyChicShel on Twitter. I follow Shelly Hill on Pinterest. I would like to treat the Greek Easter bread. I'd like to try the Golden Marble Pound Cake. I want to try the Breakfast Chalupas #2. I want to try the Breakfast Chalupas #3.